Funded by the Federal Government’s Public Works of Art Project. Henry J. Tanous, the son of Syrian immigrants, was born in Hettinger, North Dakota. He studied at UND, the Chicago Academy of Fine Arts, and the Minneapolis Art Institute. In 1939, Tanous moved to California, where he became an animator for Disney Studios. During the Great Depression, Tanous was hired by the Public Works of Art Project to paint North Dakota subjects, such as the painting on display. 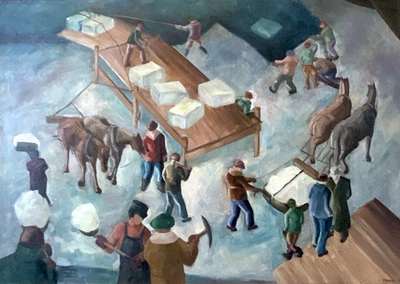 Loading Ice Blocks is executed in a Regionalist manner comparable to the style of Thomas Hart Benton (1889-1975).